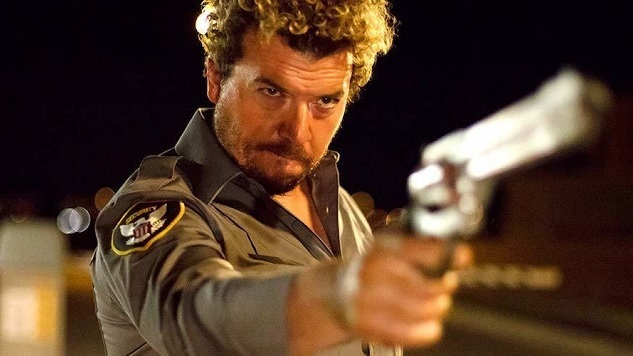 Danny McBride’s career is built on a rogue’s gallery of assholes who remain likable in spite of their assholery: Fred Simmons, Kenny Powers, Prince Thadeous, Neal Gamby, and, well, Danny McBride, or an exaggerated version of Danny McBride who happily devours his ex-friends to survive the apocalypse. He’s played a few straightforwardly likable characters, too, but for the most part McBride’s name evokes primal, smirking dread. On average his characters come off as friendly enough, but getting buddy-buddy with them means cozying up to wolves. At best, they’ll mock you. At worst, they’ll bite your face. Sonny, his character in Jonathan Watson’s Arizona, is no exception, an unstable, down on his luck sad sack who steadfastly refuses to accept any blame for circumstances: Everyone else is at fault for his financial misfortune. In this case, he’s not wrong, necessarily. Arizona occurs following the 2008 financial crash, a year after the economy’s carotid burst and deprived countless Americans of the lifeblood of homeownership. But though Sonny is the victim of fiscal malfeasance, it’s difficult to feel too much sympathy for a character whose solution to his woes is a murder spree with no logical endpoint. McBride is joined by Rosemarie DeWitt, playing Cassie Fowler, a struggling real estate agent hawking McMansions in the Copper State’s suburban wasteland. Cassie, by ill luck, winds up entangled in Sonny’s downward spiral when he confronts her shady douchebag boss (Seth Rogen), the man who sold Sonny the house he can no longer pay for, and in a scuffle accidentally kills him. Cassie witnesses the whole thing, and so her fate is conjoined to Sonny’s as his rampage commences. He takes her hostage, warms to her, turns on her as soon as he finds out what she does for work, then warms to her again, and so the cycle spins as Cassie searches for a way out of her predicament. Arizona’s violence shocks and jolts but also gives the film its shape. It’s neither gory nor particularly inventive in the art of stage death, just abruptly bloody, which makes guessing Watson’s favorite filmmakers an easy task: Tarantino, perhaps, or the Coen brothers more likely. The more desperate Sonny grows as he tries to cover his tracks, the higher the body count ticks up. The keyword there is desperation. Arizona, in its bloody fashion, is a film about desperation, a snapshot of desperate times in recent history sensationalized via the contours of the thriller. Cassie is as desperate to make it out alive as Sonny is to dodge personal responsibility for his subprime burden (and for the trail of corpses he leaves in his wake). And from that desperation stems a flood of wanting. Watson couches his chief thematic concern in the movie’s setting: The housing community where Arizona unfolds is peppered by oversized and empty houses, left to blister beneath the blazing sun. Like Sonny, Cassie wants to keep her house. Unlike Sonny, she doesn’t give a damn about the extras: High end tiling, an in-wall remote controlled home sound system, a pool, and more, more, more. Arizona takes Americans’ particular hunger for material possessions, money and the status that both confer to an extreme, but the extreme has gravity. Wealth culture is the American dream, and Americans are conditioned to reach beyond their means to see that dream realized. Arizona doesn’t take itself as seriously as such a weighty theme might imply. With McBride up its sleeve, it can’t. He’s a monster with a visor closed around his frosted tips, the definition of “laughable” and “unhinged” at the same time. Watching him flounder and bungle every single thing he does, all the while whining about his bum break or his bad back, is a hoot, a reprieve from the horror of his brutal rages. Watching DeWitt outmaneuver him, even as he inexplicably maintains the upper hand, even as his crimes grow increasingly personal and abominable, is an exercise in marrying tension with dark delight. She’s the one the audience should be rooting for, but Sonny’s a charming maniac. Sure, he’ll blow your head off if you cross him, but damn if he’s not the kind of guy you could have a beer with. Arizona bathes its absurdist satire in the bleakest humor and takes a sober glance at the consequences of America’s worst modern economic calamity. It’s a portrait of what happens when people’s worlds are stolen from them. It’s a remark on our reckless need to buy what we can’t afford. Most of all, though, it’s a showcase for McBride’s knack for making character studies out of blustering macho madness.